Earn 782 loyalty points when you order this item. These floor-stands are designed and manufactured in Great Britain and produced without compromise and are machined from the finest materials including Stainless Steel and Aluminium by skilled craftsmen using the latest C.N.C. machines. All our speaker stands are hand built to your requirements and are fitted with our fully isolated uniquely designed spikes, thus allowing the clear sound of “Just the Speakers” to be enjoyed. Isolating the cabinets from the ground means you're hearing just the speaker, not the colouration caused by excessive contact. Saw these in Audio Affair's store and was intrigued. 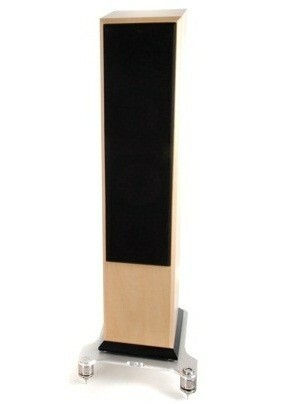 Theyre not speaker stands for small speakers, theyre platforms for floorstanding speakers. Dubious at first (arent floorstanding speakers meant to sit on the floor and the spikes are there to give them stablility?) I had a listen to some speakers with and without and could immediately hear the difference. Bass was tighter and the whole soundstage became more organised. I thought it could be a room effect (their demo room is quite high ceiling), I bought a pair nevertheless for use with my B&Ws and much to my delight there were definite improvements at home as well. A recommended upgrade. If you're speakers cost around £2000 or more, you owe it to yourself to have a listen to these.